Swords represent the element of air, thought and intillect and are therefore represented by Mercury (which may be relevent according to this morning’s correspondences as Mercury shifts into the sign of Virgo at 5:51 a.m. US Central time, approximately one hour from now. Incidentally, Mercury is Virgo’s ruling planet, so it’s a “homecoming” of sorts cosmically speaking. I’ve a lot to learn yet about the dance of the planets, so just ’cause I’m stating the facts does not mean I know exactly what it means *smirk*). Although represented by swords and thought, the image in the Six of Swords card shows three people in a boat traveling by water, and water represents emotions. Could it be time to change the way I think about how I feel? How am I navigating the journey where thoughts and feelings merge? Perhaps it’s time to be led by the mind instead of the heart, or to find a way for the two to peacefully merge. Mercury, Virgo, and Swords indicate a more analytical energy. There’s a change of direction in this card, if not a physical relocation or journey, then a complete change in perspective. Now is the time to navigate, to take control, to “row the boat to shore”. Because there are two additional people in this card, it indicates a sense of responsibility, an awareness that the actions taken by the quarrent will have consequences that affect others. This makes me think of what I’d written last night about making sure my children feel secure and as though they’re on solid ground after such a difficult year of change. Sixes represent the ability to reach above and beyond what seems like reality in order to tap into a higher source of strength, inspiration, and universal wisdom. The round belly of a six represents the earth, and the arm extending beyond that round belly is the quarrent’s ability to reach out to the heavens and grab a handful of magick to bring down to earth. Moving away from illness, pain, or sorrow; recovery; taking action to overcome one’s problems; better times ahead so keep going; a journey often planned due to unhappy circumstances; the need to “get away”. The Slough of Despond is a good name for the Six of Swords. Sometimes this card represents a dull, listless state. Nothing is seriously wrong, but nothing is really right either. You’re getting by, but not thriving. In the picture the figures in the boat seem sad and disengaged. Life is indeed uninteresting when we feel the blues. 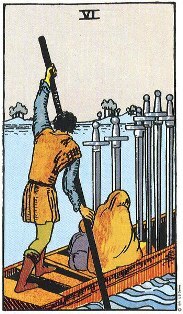 In a more positive vein, the Six of Swords can indicate recovery. This is especially true when you have just experienced a tough time or psychological blow. During the crisis, you felt numb and disconnected; nothing mattered at all. Now you are beginning to heal and pick up the pieces of your life. The travelers in our boat are at least moving forward. They are headed toward a new place, even if they are not yet ready to eagerly embrace those shores. In fact, the Six of Swords can indicate travel and moves of all kinds. This could mean an actual change of scene, relocation or trip, but not necessarily. A journey can also take place on the inner planes as we move from one frame of mind to another. Although the Six of Swords does not promise great joy, it also avoids the depths of despair. A slough is not a bottomless pit, but simply a hollow or depression. When you see this card, know that even though the situation is not ideal, you are moving toward a more positive place. Change is in the air, and new, more hopeful conditions lie ahead. Sixes are balance and harmony, especially after the upsets of the fives. These cards predict a solution, and not just any solution; there will be an exchange, a give and take that results in a new equilibrium. It may not last, but for that moment, everything is stable. With this card, there is an almost “Ah-HA!” of recognition, of understanding in the solution, and more than a little awe at the symmetry achieved by it. If you connect the sixes to the Lovers card you’ll see how it works. The “love” aspect of the Lovers card is that of recognition and equilibrium. Like Gemini, you recognize your twin, your soul mate. Maybe you didn’t even know how uneven, how lopsided your life was, but now that you’ve met this person, you can feel the scales coming into balance. Here is harmony. Here is the solution. A boat of swords being ferried across a river with a woman as passenger. The classic Rider-Waite meaning is that one is leaving difficulties behind. A trip or change of scene may be the answer to restoring balance here. But there is more to it than this. In relation to the mind, ideas and words of the sword suit, this is also about finding a solution to math problems and brain twisters, not just troubles. The ferryman may signal help here, a silent partner (a reference book or internet website perhaps?) who helps you row your way toward the other shore…and THERE is the answer, a way to make your idea, your argument, your formula work smoothly, perfectly, beautifully. Also, of course, a card about trips by boat.